The responsibilities of the Wasco County Soil and Water Conservation District encompass the entire area that represents Wasco County. In order to fulfill its responsibility and to render assistance more efficiently the district relies on local input. By fostering watershed councils the district has a means of identifying and addressing resource concerns by those living within their watershed.The watershed councils are a way to focus manpower and resources on natural resource issues within individual watersheds guided by locally led conservation strategies. Bakeoven/Buck Hollow Watersheds - Bakeoven Watershed is approx 98,000 acres. The Bakeoven Watershed Council was formed in 1995. Buck Hollow is 120,000 acres and is shared with Sherman County. The Council was formed in 1991. White River Watershed is 350,000 acres. The Council was formed in June 2000. Mosier Watershed is 50,000 acres. The Council was formed on December 9, 1999. Pine Hollow Watershed (South Wasco County and South Sherman County) is 83,725 acres. Sherman County's Pine Hollow/Jackknife Canyon Watershed Council oversees restoration activities for this watershed. House Bill 3441 was passed by the Legislature in 1995 to provide guidance in establishing local watershed councils. 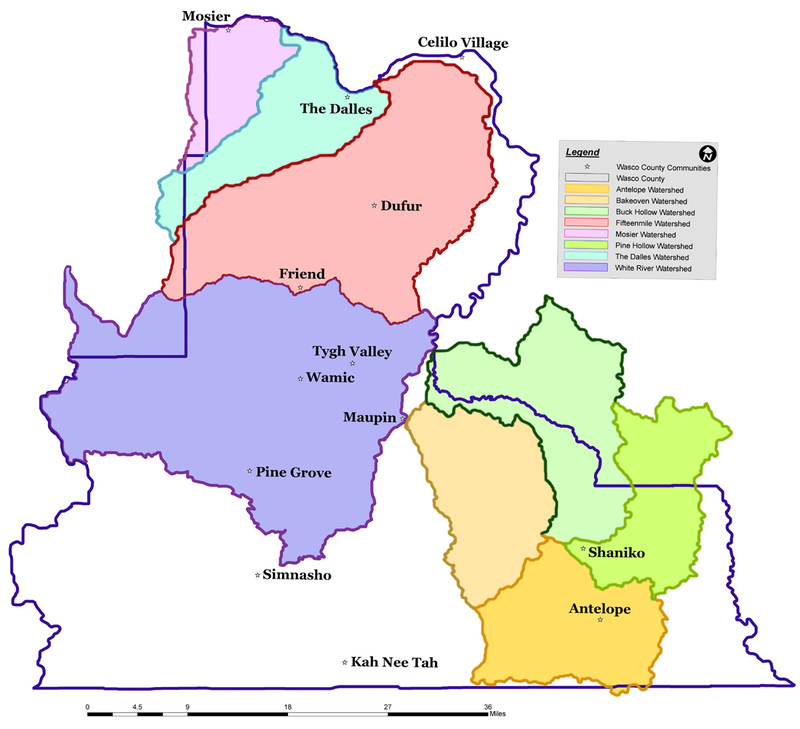 Watershed councils established under ORS 541.910 (1) and (2) specifies that they "shall consist of a majority of local residents including local officials, as long as the council represents a balance of interested and affected persons within the watershed". This to assure a high level of citizen involvement in the development and implementation of watershed action plans. (4) "Watershed council" or "council" pursuant to ORS 541-890(15), means a voluntary local organization, designated by a local government group, convened by a county governing body, to address the goal of sustianing natural resources and conducting watershed protection, restoration, and enhancement within a watershed as defined in ORS 541-890(14). Basically, watershed councils are voluntary, locally organized, non-regulatory groups established to improve watershed counditions in their local area. The goal being to restore or enhance watershed conditions and function for the betterment of all - agriculturally, environmentally, and economically. The partnerships formed between local residents, local, state, federal agency staff and other groups through watershed councils, not only provides an opportunity to foster a deeper understanding between the groups, but also focuses technical and financial resources into the watershed to achieve restoration goals.